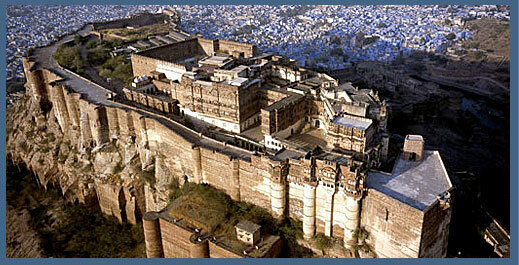 Mehrangarh Fort, located in Jodhpur is one of the largest forts in India. 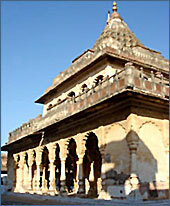 It was founded by Rao Jodha in 1459. 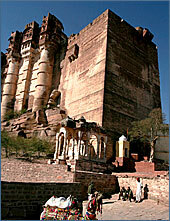 The Fort stands a hundred feet in splendour on a perpendicular cliff, four hundred feet above the sky line of Jodhpur. Seven gates have to be crossed to reach the fort. The gates still bear the marks of the various battles fought in the bygone era. The most notable Jaypol was built by Maharaja Man Singh in the year 1806; Fatehpol, also known as the Victory Gate was built by Maharaja Ajit Singh and the Lohapol, which is also known as the Iron Gate. Located at 2 km southeast of the Jodhpur city at the top of a hill, Umaid Bhawan Palace is another major landmark of Jodhpur. 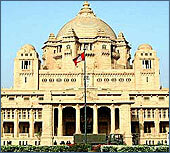 Maharaja Umaid Singh constructed it in 20th century. The palace is made of marble and pink sandstone. This edifice was started in the year 1929 and took almost 16 years to get completed. A part of the palace has now been converted into a hotel and a museum. 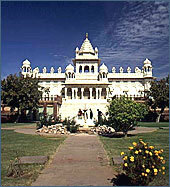 The Jaswant Thada is an architectural landmark located in Jodhpur. It is a white marble memorial built by Sardar Singh in 1899 in memory of Maharja Jaswant Singh II. The carving shows the genius of the sculptors. These stones are extremely thin and polished. The main memorial has been built like a temple. To visit the Thada you have to go through the rocky hills. This also lends a mystic aura to the whole visit. Do make sure to visit this architectural delight while on a tour to Jodhpur, Rajasthan. 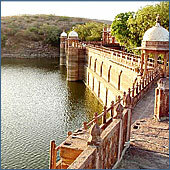 The Balsamand Lake in Jodhpur is a popular picnic spot. It is an artificial lake built in 1159 AD. Balsammand Lake is approximately 7 kms from the main city, on the Jodhpur - Mandore road. All around the lake are lush green gardens. You can also take a walk through the trees, the rose beds and around pools covered with lilies. The peaceful surroundings of Balsammand Lake will leave you at peace with yourself. Mandore garden is a popular local attraction. In the Mandore garden, there are the dewals or cenotaphs of Jodhpur's former rulers. Mandore garden has high rock terrace. The garden is open for tourists from 8 am to 8 pm. Set against a rocky wall are a pillared compound, housing the "Hall of Heroes" and "Shrine" of the 330 million gods. Tours to enthralling blue Jodhpur are incomplete without tours to the glorious Mahamandir that is located on the Mandore Road, located at a distance of 9 kilometers from the main Jodhpur city. The temple is an architectural splendor, supported by 84 pillars and ornamented with detailed designs and figures depicting various postures of Yoga. There is an aura of peace and a feeling of bliss in its surroundings. There are a large number of devotees who flock to this temple to offer the prayers and seek the blessings of the presiding deity.